When you think of Kevin Costner, you think of a good-looking chick magnet that makes men cringe when he comes on TV. You think of a pretty popular actor who always seems to put out bad movies. You certainly don't think of a man who can act in any serious movie that doesn't involve baseball. changing all that. The two-and-a-half hour thriller/documentary goes into complete detail concerning the events and circumstances that brought America to the brink of war during 13 days in October, 1962. A lot of people don't really know what happened during the Cuban Missile Crisis. All the red tape it was wrapped in well into the 1990s left the whole event shrouded in plenty of mystery. Even though a lot of new papers and tapes have supposedly been released to the public in the last few years, we'll never be sure if the movie even accurately depicts the activities that took place. That being said, it really doesn't matter. 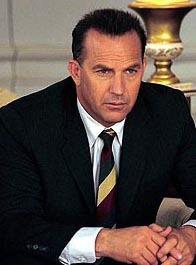 Costner ("3000 Miles to Graceland," "Robin Hood: Prince of Thieves") plays Kenny O'Donnell, the special assistant to President John F. Kennedy (played by Bruce Greenwood, "Double Jeopardy"). The President relies heavily on O'Donnell and his own brother, Attorney General Robert Kennedy (played by Steven Culp, "Nurse Betty") to help him deal with an amazing roller coaster of events. The trio starts with the discovery of missiles being put into Cuba, and works its way through a series of twists and turns that could only be written by real life. fighting insomnia. But not this time. The other actors throughout the movie, most notably Culp and Greenwood, play their characters brilliantly. JFK was always known for his ability to swing moods a few times a minute, and that isn't lost on Greenwood. One second he is steaming over his Joint Chief's under-the-table plot to take America into a war, and the moment he's ready to drop a bomb himself. Culp portrays Bobby Kennedy as just another advisor up until the end, where he plays maybe the most important role in the movie. Once again, though historic facts are largely inconclusive, that seems to flow with everything that happened in the real situation. All in all, this movie not only returns Costner to the forefront of serious acting, but it continuously moves you from the back of your seat, to the edge, and back again. The tagline for the movie says "You'll Never Believe How Close We Came." After watching this, you probably still won't know for sure. But at the very least, it is a great movie, and without a doubt is the easiest three-hour Costner movie to sit through.